As young as 14, Jeff King was drumming in bands and in years after would continue writing music and touring. He was the final drummer in Arkansas’ Handshake Murders before taking on a path to sound design and mixing films. Where he was once arranging music as a part of the song-writing process, he is now arranging sounds to create a rhythm for scenes and character experiences in film. “Sound effects convey realism and create the world and space in which the movie exists. The music is a reflection of that, driving the emotion and steering the audience in any given direction,” says King about the process. Jeff spends hours that turn quickly into days recording, editing, and arranging the sounds that draw the viewer It work is not guesswork, but reflecting on the things going on around us in the world. In our conversation King mentions the time spent observing life and listening to the world around him as key moments in research. Because his work is sound intensive his best tools are his eyes and ears, taking in the world that he navigates every day. Knowing the appropriate sounds that correspond to particular visuals is not intuitive; it is a particular sound that becomes associated with certain objects and in certain situations. As we discussed further the use of sound, King comments about the sound editor’s responsibilities based on the duties that sound effects and scores assume in his work. Throughout a film it is necessary for the score to overshadow the effects, and vice versa, so that upon completion they have effectively worked together. “They need to always be in conversation with each other and complement each other from the start [of the film],” King says. Among King’s recommended films were 1981 film Blowout and The Berberian Sound Studio from 2012 (which was available on Netflix at the time of this article). Kings filmography can be found at IMDB. 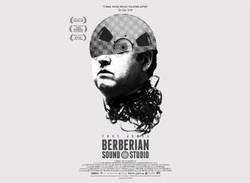 The Berberian Sound Studio concerns the profession of sound engineering in film and the unraveling of the main character while working on a mysterious film. The introduction to the movie provides a great transition from my conversation with Jeff King. Where accuracy is a strength in sound effects, the film’s blurry opening is given some degree of context because of the clicking sound associated with the firing of a film projector. This context is relevant given the film’s primary setting. In addition, it does not disturb the state in which the film’s story and events exist. It’s not an unrealistic film per se, but this opening gives the filmmaker license to guide the viewer through this onscreen tale in their own way. There are few characters and nothing related to the story is spoon fed to the viewer. Instead you may feel as though you are catching up in chunks on where the story may be headed. Freeing yourself of the anticipation to get to the is a necessary freedom for viewing many films and something that helps for films like Studio. While this can be said for every viewing experience, it is difficult to find that freedom as a viewer if you are in the habit of watching films that deliver the story to you with big blinking lights. It’s also a stylistic difference but the viewers are always caught in this process. In my opinion, film taste is not singular (contrary to the singular and plural agreement). I think a contrast is essential to developing tastes. It is a task to watch contrasting pieces without having different processes or states of mind in doing so. Leading up to my viewing of Studio I have restarted X Files, LOST, watched Rush (1991), Daredevil on Netflix, The Babadook, Brody Stevens’ Enjoy It, and on and on. My point is that everything we watch has an effect on how we watch. Do you ever binge a show and really wonder why? Are we addicted to the characters of that show, or the mere act of binge watching? If we are addicted to the act of binge watching, then why is it not easier to bounce from show to show in a binge session? I am exploring this a bit trying to watch LOST and X Files, hypothesizing that I will be interested in each show more if I am watching them congruently. I’m not even sure how I watch things at times, generally, though I take notes in an effort to be conscious of my state of mind or focus. Anyway, the same way we operate as viewers, so do professionals. Your reality is unique to you. Though we exist in the same reality (I assume), our realities are different. Our ways of watching are different and one person’s tastes in entertainment are different from another’s. In the end, this film talked to me in how I view things in this reality and how I watch characters in their reality. Posted on July 5, 2015, 3:37 p.m.
Posted by BJ Rochinich on July 5, 2015, 3:37 p.m.